Patrik Lindström Electro, Synthpop Memories is the fifth installment about the sci-fi noir character Mr. Black and his adventures and mysteries. I'm saying the fifth, even though it's the sixth studio release from mind.in.a.box since the release R.E.T.R.O. surely is not meant to be part of this collection of stories. 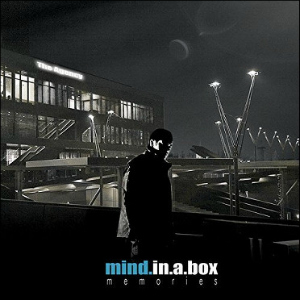 mind.in.a.box's releases tends to leave the fight with Brutal Resonance with high scores and 'Memories' is no exception. If you have heard Revelations you have pretty much heard 'Memories'. The sound is quite the same, and I'm quite sure it's a good thing. I mean, you get exactly what you expect from mind.in.a.box, nothing more, nothing less. It's one of those albums you can listen to, both actively and as background noise, over and over, BUT (here comes the but) I lack the goose bumps I get from Revelations or <[aid>mindinabox-lost-alone. I have question myself lately over this album. Some of the tracks are so beautifully made. The soundscape is excellent, even perfect sometimes. Take "No Hope", "Bad Dreams", "Silent Pain", "Timelessness" or "Up There" for example, they are all great, but perhaps they are simply a little bit too perfect? Right about now, half of you probably think I've gone mad during my longer periods of reviewlessness (Timelessness, reviewlessness, get it? ), but let me explain. I'm sure you'll get my thinking. 'Memories' is something quite logic. It's math. It's a formula for creating a mind.in.a.box album. It feels like it has been created by the logic brain of a Vulcan (Live Long and Prosper Mr. Nimoy - we'll miss you) rather than the heart of a man, and thus it connects with my mind more than with my heart. Memories is the fifth installment about the sci-fi noir character Mr. Black and his adventures and mysteries. I'm saying the fifth, even though it's the sixth studio release from mind.in.a.box since the release R.E.T.R.O. surely is not meant to be part of this collection of stories. Don't get me wrong, 'Memories' is a really good album, some of you will probably find it to be one of your favorite releases this year and I hold no grudge for it. I like it to, however, I feel that if I get in the mood for some mind.in.a.box, my bet is that I will listen to Revelations, because to me, that invokes much more feeling. Most of the time, I want to listen to a CD with my heart and not my mind.